What a mad town. Every time I'm here I love it more and more. 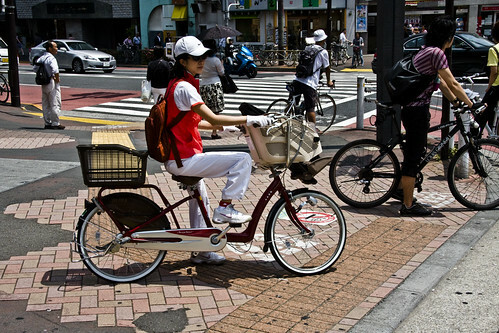 Standard Japanese Supermum - mamachari. How do the Japanese always manage to look so much cooler than the rest of us? Something I did notice when I was in Tokyo & Kyoto, was that most of the Japanese clothes shops that I went to sold clothes made in Japan. And really pricey. I thought it was odd because I was expecting Chinese-made stuff in a developed country. Also, I did not meet many obese people there. Did you happen to see any Arrow cycles there? They even make riding a crazy array of bikes (like here in the US) look normal. Hey Mikael, what's their infrastructure like? Will you be commenting about it on Copenhagenize? Dare I say it? 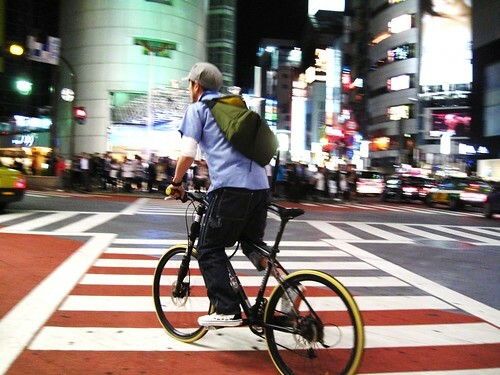 Uhm, yes: Tokyo, no helmets. Good on them. Hey Mikael, you do get around these days! I love number 1 and 3.